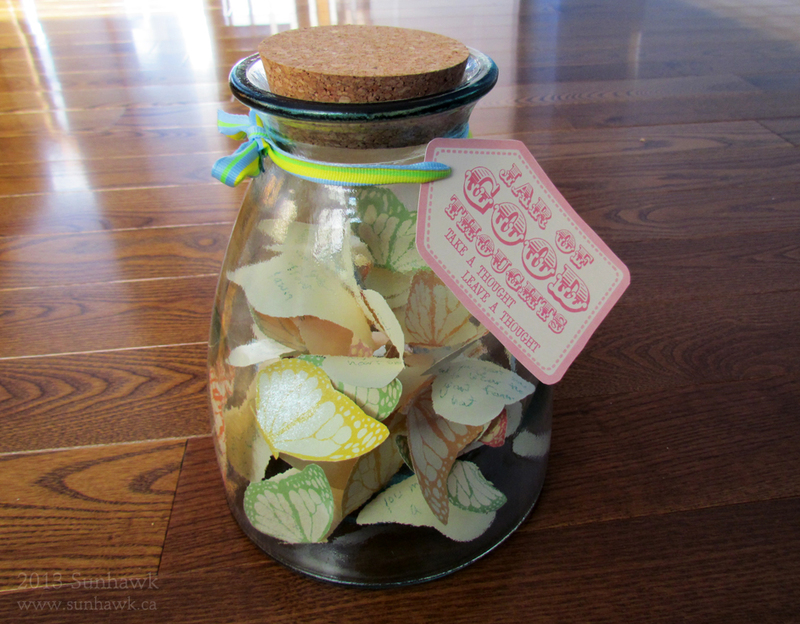 Just after New Year’s, I encountered a cute idea being passed around on Facebook: Get a mason jar and every time something good happens to you, write it on a scrap of paper and put it in the jar. The idea was that by the end of the year, you would have a jar filled with little bits of paper and you could then take them out all at once and remind yourself just how many good things happened to you in just one year. It was a delightful thought and I was all ready to start my own jar, but there was just one problem: I didn’t have any empty mason jars hanging around at the time. 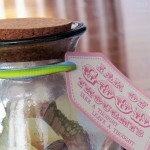 By the time a jar came about, it was already a month into the new year and I’d lost my momentum for the idea. But then, a few weeks ago, the idea came back to me while I was trying to think of a gift for one of my best friends. Without going into details, she’d had a really rough year and I wanted to make her something to let her know that she wasn’t alone and that I was thinking good thoughts about her. Good thoughts… hey now… My mind returned to the jar of good thoughts, with an additional twist: what if, instead of filling up her own jar of good memories, I put together as many good memories of us as I could (which is a fair number, since we grew up together, living down the street from each other as kids) and also add to it good thoughts I had about my best friend, things I admired about her or thought she should know were pretty awesome. So I had a neat idea, the next step was to decide how to visually represent “good thoughts” – clearly, this called for something a little more fancy than little ripped scraps of paper. To me, nothing seemed more fitting than using butterflies to represent both a good thought (what a pretty, delicate and lively thing a good thought can be) and also as another happy reminder of our childhood, as I’d raised many a caterpillar in glass jars and I had my own fond memories of watching a butterfly float free out of its glass home. Find yourself a suitable glass jar: it must be big enough to hold as many butterflies as you want to make and also with a large enough mouth to easily fit the folded butterflies in later on. I went to Pier One and picked a whimsically-shaped jar that had a nice large cork stopper, as I love cork stoppers and think they look really neat. 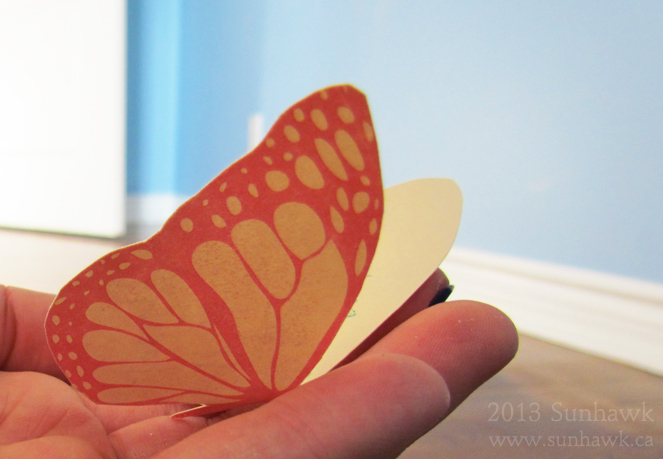 If you use my butterfly sheet, print out as many sheets as you need, and I just used normal scissors to cut them out. 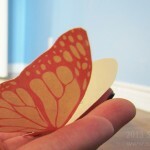 Write out your good thoughts, and once you are done, gently crease the butterfly vertically along the center (where its body is and with your thought facing inward) to give it that 3D look. 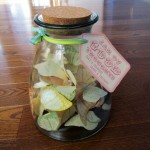 Fill your jar up until you have enough butterflies to get the look you want – I opted for a very full jar. 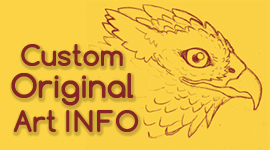 Optional: You can make a label for your jar like I did, or you can leave it as a mysterious object that will invite people to ask questions. 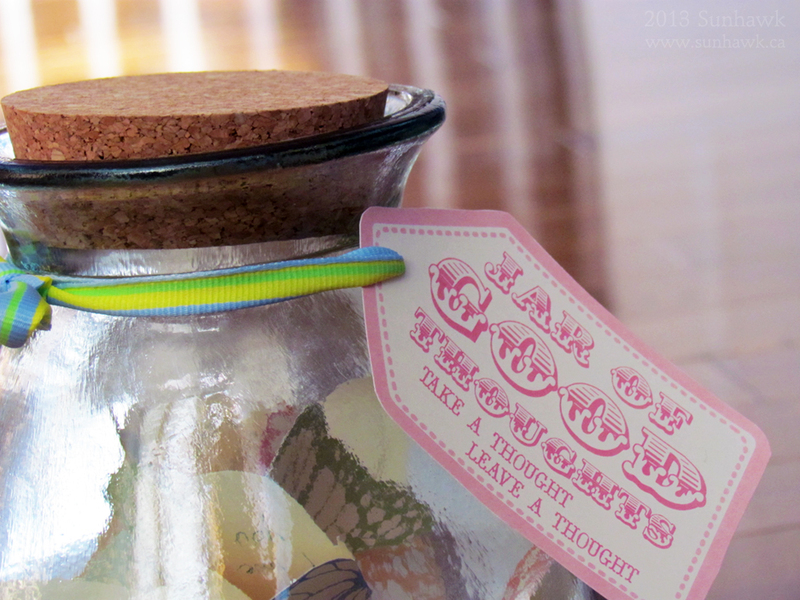 Your label can invite people to take a thought, leave a thought, or both! You’d be amazed just how many good memories and nice thoughts you can come up with when you set your mind to it, even the smallest things are worth a butterfly. Goodluck!